Instagram Your Cute Couple Pic by TOMORROW To Win I Do! Bridal Soiree Tix!! One thing is certain about the I Do! 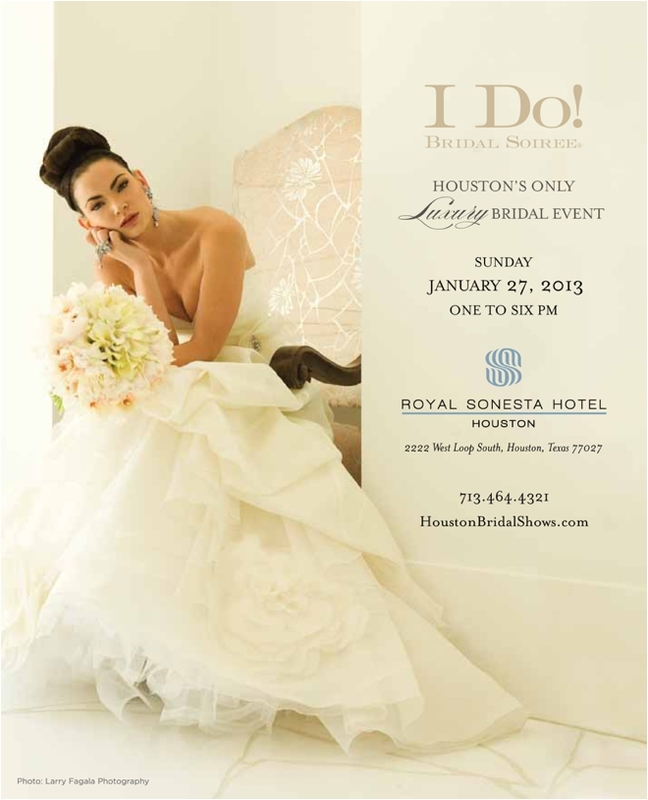 Bridal Soiree—when those Royal Sonesta Houston doors open on Sunday, Jan. 27, and we pull back the veil on our legendary bridal showcase, you are going to be WOWED. We guarantee it. And the way we guarantee it is by 1.) working our tails off to design, plan and execute the most extraordinary bridal showcase in the country, and 2.) keeping all the juicy details tightly under wraps. That said, we figure you’d enjoy an itty bitty glimpse at some of the debuts, discoveries and delicious deals you can expect from the fabulous vendors who’ll be featured at I Do! @ Royal Sonesta. So here ya go! Make sure to visit pro planners Kolby and Angie, who’ll be showing off superb wedding-coordination services from Event Solutions, along with their newest offering: WOW wedding stationery. You could score $1,000 off a full-service or partial Event Solutions planning package, and get 10 percent off your stationery order! Craving sparkle for your special day? Drop by A Memorable Event and be dazzled by the latest in LED trees and brilliant crystal candelabra, along with yummy “confetti” linens and, even yummier, $500 off your wedding rental package. And don’t miss your chance to check out Elegant Beginnings, debuting their amazing new line of fabrics, chargers, chairs and chair decor. Book your Elegant Beginnings package by April, and enjoy 10 percent off your order. Preserve your wedding memories in style with an Elite Wedding Album—featuring unique leathers such as ostrich and tooled leather—debuting from Memories by Maryanne Photography. Book your photo package at the show, and score two 4X6 flush-mount companion albums, perfect for parents or grandparents. If moving pictures are your passion, you’ll definitely want to check out hot Houston videography studio Elect Film Productions—and enter for your chance to win a $1,000 discount on your wedding-film package. And just in case you don’t feel quite ready for your close-up, Murillo Plastic Surgery will be displaying its array of cosmetic procedures and treatments—and offering Botox treatments, live, on-site, for $8 per unit! Prefer your procedures a little more private? You can score $200 off your in-facility Botox treatment or snag a free Murillo cosmetic consultation. These are just a handful of the goodies that will be on hand at I Do! @ Royal Sonesta on Sunday, Jan. 27. Make sure to GET YOUR $20 PRE-SALE TICKETS WHILE THEY ARE STILL AVAILABLE. Because you can’t win if you’re not in!